The Texas governors race is shaping up to be a real down in the mud race, which is how Texas political races usually are. The Bill White camp has thrown out the first dirt ball. Well not exactly Bill Whites official camp. Its from a PAC known as ‘Back to Basics’ Financed by trial lawyers, the TV advertising, ambulance chasing Steven Mostyn in particular. This first came to my attention this morning through Mean Rachel’s blog. According to her, the Back to Basics PAC will be running the ad in Texas newspapers on Tuesday. Back to Basics is heavily funded by Houston trial attorney Steven Mostyn. We won’t know the full extent of the committee’s funding until the next reporting period, 30 days before the election. It really strikes me as weird that this trial lawyer has the nerve to call out anyone as a coward. This is a guy who is afraid to show his own face in his own commercials. The other strange thing is that The Chronicle is the only paper that refused to run the ad. This, after all, is the the Houston Chronicle and the Chronicle is Mostyn’s home news paper and Bill White is the Chronicle’s candidate. In 24 newspapers around the state, a full-page ad ran today with a picture of Gov. 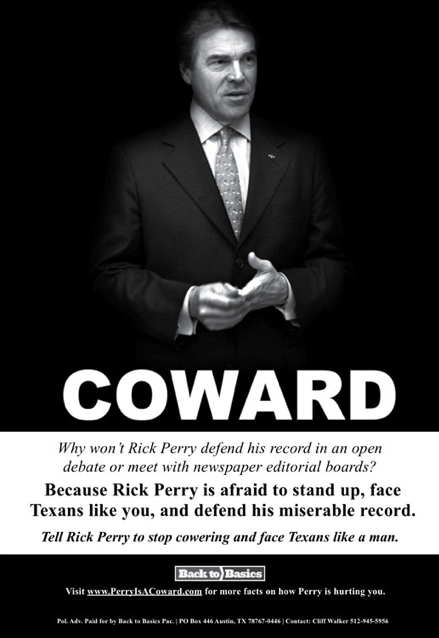 Rick Perry and the word “coward” in large, capital letters. Back to Basics PAC, the anti-Perry group behind the ad, was hoping that number would be 25. The Houston Chronicle (which happens to be hometown paper of Back to Basics’ main funder, trial lawyer Steve Mostyn) opted not to run the ad, and it turns out it was the only one. The ad passed muster at every other paper the political action committee approached, including the state’s other major dailies. These negative ads come out just after the latest Rassmussen poll which shows that White has some ground to gain. A new Rasmussen Reports telephone survey published today finds that neither major party candidate in Texas’ gubernatorial race gains any ground. According to the poll Republican Rick Perry picks up 49% of the vote, while Democrat Bill White receives 41%. Previous PostGunowners Against Illegal MayorsNext PostGPAL having Problems.